It was narrated that in the days that Prophet Musa (pbuh) wandered with Bani Israel (Children of Israel) in the desert, an intense drought befell them. Together, they raised their hands towards the heavens praying for the blessed rain to come. Then, to the astonishment of Prophet Musa (pbuh) and all those watching, the few scattered clouds that were in the sky vanished, the heat poured down, and the drought intensified. It was revealed to Prophet Musa (pbuh) that there was a sinner amongst the tribe of Bani Israel who had disobeyed Allah (SWT) for more than forty years of his life. "Let him separate himself from the congregation," Allah (SWT) told Prophet Musa (pbuh). "Only then shall I shower you all with rain." Prophet Musa (pbuh) then called out to the throngs of humanity, "There is a person amongst us who has disobeyed Allah (SWT) for forty years. Let him separate himself from the congregation and only then shall we be rescued from the drought." He raised his hands with a sincerity he had never known before, with humility he had never tasted, and as tears poured down on both cheeks he said, "O Allah, have mercy on me! O Allah, hide my sins! O Allah, forgive me! O Allah, you covered my sins for forty years, so don’t expose me now. O Allah if I stay, all will be destroyed and if I leave, I will be exposed. O Allah, forgive me and let it raiin." As Prophet Musa (pbuh) and the people of Bani Israel waited for the sinner to step forward, the clouds hugged the sky and the rain poured. Prophet Musa (pbuh) asked Allah (SWT), "O Allah, you blessed us with rain even though the sinner did not come forward." And Allah (SWT) replied, "O Musa, it is for the repentance of that very person that I blessed all of Bani Israel with water." Prophet Musa (pbuh), wanting to know who this blessed man was, asked, "Show him to me O Allah!" Allah (SWT) replied, "O Musa, I hid his sins for forty years, do you think that after his repentance I shall expose him?" If Allah SWT wouldn’t expose the sins of a person, who do we think we are to do so? Forgiveness, pardon, and concealment are the most beloved qualities of Allah SWT, and He loves those who embody these qualities. May Allah SWT allow us to be among them. An early scholar wrote an entire book on this topic and discussed in detail why Allah SWT loves pardoning and concealment of sins. All his discussions lead to one conclusion: it is for the benefit of society. Who amongst us doesn’t commit sins; when we forgive, pardon and conceal the sins of our fellow Muslims, it maintains peace, tranquility, and harmony in the society which benefits everyone. On the other hand, if the sins are exposed and amplified, it creates an environment of distrust, rancor, and agitation; which harms the entire society. This is the benefit of this world only. In the afterlife, people embodying these qualities are elevated and according to some sayings of the Prophet SAW, enter paradise without reckoning. What an honor! With the availability of social media, we see a growing phenomenon and a fitnah in the Muslim world—spread of unverified information and claims. It is the opposite of the teachings of Allah and His prophet SAW. These unverified claims spread over the social media amount to backbiting and slandering, and can shred the very fabric of society. Most people mean well and in their ignorance, they believe they are doing good to the society by ‘exposing an evil act’ or ‘seeking justice’. However, the reality is quite different. The implications of their actions are dangerous, not only for their own selves, but for the entire society. Exposing others actions is detrimental to a person’s spiritual wellbeing. It makes them feel good about themselves. It gives them a sense of self-righteousness which inflates their ego further. It makes them feel like they have done a service to others while in reality they have surrendered to the devil, going explicitly against the teachings of Allah SWT and His Prophet SAW. This venom from their hearts takes on a life of its own and continues to spread and poison the society. It tears apart families, friends, and communities. Not only are these actions hated by Allah SWT and His Prophet SAW, they harm the accuser and gossiper before harming the accused. The one backbiting about others’ sins loses his credibility and trust in society; the curse of Allah SWT follows such people and their families and people start distancing themselves from him. This matter is not to be taken lightly. Always weigh the consequences of your actions. Any action beloved to Allah SWT, Allah wants us to carry out and any action hated by Allah, He SWT wants us to refrain from it. Anger, revenge, backbiting, slandering, spreading unverified information are all such actions. Refraining from them is a requirement of our deen, and is highly virtuous in the sight of Allah SWT. He did not blame the actions of his brothers. He blamed the shayateen of his brothers. This is the quality of a believer—to hate the sin, not the sinner; to hate disbelief, not the disbeliever. “I speak to you in the same words of the prophet Yusuf (pbuh), who spoke to his brothers” and Muhammad (SAW) recited “No blame will there be upon you today. Allah will forgive you; and He is the most merciful of the merciful”. Then he announced to them that they are free now and they may go where they please. This is Islam. This is sincerity. Sincerity shows up only at a time when our nafs wants something and Allah wants the opposite. Sincerity is manifested at a time of desire, temptation, calamity, hardship, financial difficulty, oppression by someone, disease, loss of a loved one etc. 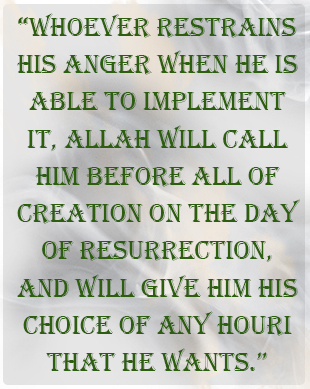 This is the time when a person will either act and react according to Islamic teachings, or according to his own nafs. This is the moment that separates a strong believer from a weak one, and a Muslim from a hypocrite. May Allah SWT give us the internal vision (baseerah) of true believers and may He guide us to the right decisions and actions at all times.